In our first article of the Foot Function & Fascial Lines series we explored the integration between the Spiral Line and the Deep Front Line as it relates to propulsion and the 1st MPJ. In today’s article we are going to explore the functional integration between the Lateral Line and the Deep Front Line – and how understanding this integration can improve rehab and training programs for those clients or athletes with lateral ankle instability. Ankle sprains are one of the most common injuries to the foot and ankle, with a prevalence as high as 70% in sports such as basketball and soccer (Yeung 1994). 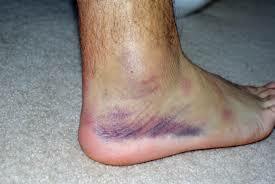 Ankle sprains can range from very minor (Grade 1) to so severe the person requires surgery (Grade 3). 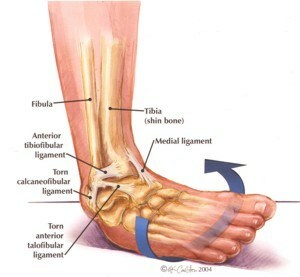 The most common type of ankle sprain is a Grade 1, or a minor ankle sprain with the most common mechanism of injury as plantarflexion / inversion of the ankle. According to the American Orthopaedic Foot & Ankle Society, most patients with a minor ankle sprain never seek medical attention – however even the most minor ankle sprains demonstrate residual impairment in stability and proprioception. In fact a 2012 study by Yentes et al. found that those athletes with a history of ankle sprains were at a 5x greater risk of re-injury with 70% of ankle sprains presenting with residual “giving way”. Dynamic ankle stability is achieved through both mechanical structures and neuromuscular control. Both must be present for optimal ankle stability, with the inability of one to make up for the loss of the other. Mechanical stability comes from ligaments, tendons, bony block and retinaculum (bands of fascia). While neuromuscular stability comes from proprioceptive input from the joint capsule, ligaments, musculotendon junction, fascia and skin. Although the above structures contribute to dynamic ankle stability on a local level, we must also consider the global control or contribution that more proximal structures have on lateral ankle stability. The concept of proximal stability for distal mobility is not new to the health and fitness industry and you may currently look at your clients or athlete assessments and programming with this perspective. If you have not yet considered the role proximal stability plays in dynamic ankle stability, I challenge you to consider the below concept. To begin to support this concept of proximal stability for dynamic ankle stability, a 2006 study by Friel et al. demonstrated weaker gluteus medius strength on the same side in subjects with ankle instability. Does this mean that the ankle sprain led to the gluteus medius weakness? Or vice versa? Although this may seem like a chicken or egg situation, I strongly believe that it is the latter. I believe that due to the deep integration between the foot and lumbopelvic hip complex, that a delay in proximal stability would set the client or athlete up for an sprain or ankle instability. To further explain this concept we must return to Thomas Myers’ Anatomy Trains. 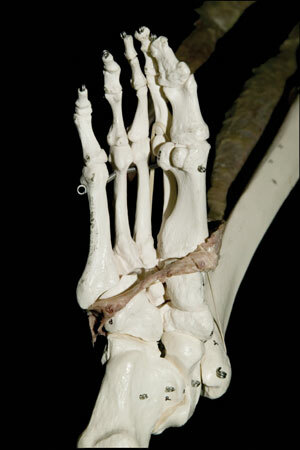 The Lateral Line begins at the base of the 1st metatarsal at the insertion point of the peroneus longus muscle. The peroneus longus travels obliquely across the plantar aspect of the foot, under the cuboid and posterior to the lateral malleolus. 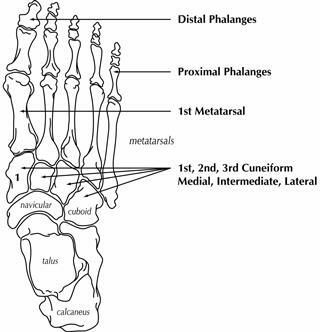 As the peroneus longus travels to the lateral aspect of the cuboid it joins the peroneus brevis muscle which attaches to the base of the 5th metatarsal. Together the peroneus longus and brevus along the lateral aspect of the lower leg to insert at the head of the fibula. The Lateral Line takes a jump to join the iliotibial band on the lateral aspect of the upper leg and connects to the gluteus maximus and tensor fascia lata. Here the Lateral Line continues to join the internal / external obliques. In our first article we described the Deep Front Line, but let’s review again. 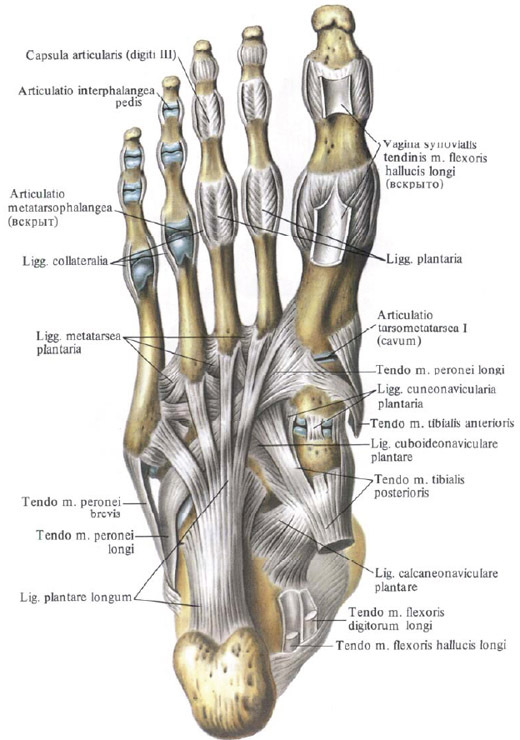 In the plantar foot the Deep Front Line consists of the deep posterior leg compartment including the posterior tibialis, flexor hallucis longus and flexor digitorum longus. 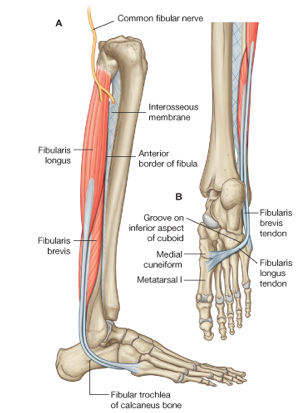 For the purpose of this article we are going to focus solely on the posterior tibialis. This fascial attachment between the posterior tibialis and the peroneus longus joins the Deep Front Line to the Lateral Line allowing for more integrated foot biomechanics. So in other words faster dynamic ankle stability (or Lateral Line stability) requires faster stimulation of the Deep Front Line. So how do we tap into our Deep Front Line faster? The answer to this question is one of my favorite exercise for foot strength – short foot! Short foot is a foot activation exercise that was first introduced by Janda et al. This exercise targets the abductor hallucis on the medial side of the foot. Because the posterior tibialis (Deep Front Line) attaches to the navicular bone, activation of short foot stimulates the Deep Front Line leading to proximal stability and subsequent Lateral Line stability. A 2009 study by Nigg et al. demonstrated that the greater the intrinsic foot strength the faster the ankle stabilizers fired. Because barefoot training is one of the greatest ways to tap into the foot intrinsics you could argue for the benefit of barefoot training in those clients and athletes with a history of ankle sprains or instability. A 2002 study by Blackburn et al. demonstrated that after just 7 days of integrated intrinsic foot strengthening (i.e. short foot) gluteus medius activation increased by 200%! This could further support the association between deep foot activation, proximal stability and ankle stability. So how do you apply these concepts to your clients and athletes with ankle instability? First step is teaching them short foot! After the concept of short foot is understood begin to integrate short foot into all ankle stability exercises. I particularly like barefoot balance exercises with short foot when my patients do their rehab programming. To see some examples of barefoot balance progressions please click HERE! From the minimalist footwear movement to barefoot training, one of the greatest benefits of getting out of the orthotics and motion-controlled shoes is the activation of the plantar intrinsic foot muscles. As the health and fitness industry begins to embrace the many benefits of intrinsic foot strength, researchers are starting to question which foot exercises may be the most beneficial for strengthening the plantar foot. Which foot exercises could we consider to be evidence-based? If we considered the intrinsic foot musculature, the most important or most influential intrinsic muscle would have to be the abductor hallucis. I always talk about the short foot exercise as the most effective exercise to target this muscle, but a recent 2013 study by Kim et al. questions the benefit of short foot – and actually explores the benefit of perhaps another exercise. The exercise in question is referred to as toe-spread. In the study Kim et al. demonstrated through EMG analysis that when performing the toe spread exercise there was almost 45% greater muscle recruitment of the abductor hallucis. So does this mean that toe spread trumps short foot when it comes to intrinsic muscle exercises? Not necessarily! Kim et al. found that the ability to perform a toe-spread exercise was limited in those subjects with a bunion due to the altered position of the abductor hallucis tendon. It is important to note that those subjects with a bunion were able to perform short foot and achieve abductor hallucis activation. This is important to note as many of our clients, patients and athletes may have a bunion deformity and we need to choose the most appropriate exercise to target their foot type and abductor hallucis alignment. It should be noted that in subjects with a bunion, the abductor hallucis can still function as a subtalar joint invertor and supporter of the navicular bone. Whether you decide to have your clients and patients do short foot or toe spread, the programming should be the same. I use intrinsic strengthening as the foundation to all my patient rehab and foot strengthening programs. From plantar fasciitis to post-ankle sprain, all patients can benefit from activating the plantar foot. When activating a muscle you will want to focus on isometric contractions as these have the greatest motor unit recruitment. Begin by hold short foot or toe spread for 10 seconds. Relax. Repeat 5 – 8 times. After waking up the abductor hallucis now you can focus on building strength and endurance in this muscle. Perform 10 – 15 repetitions per side for 3 sets. Your client or athlete may begin to feel the abductor hallucis fatigue or cramp. If this happens do not push through the cramp as it can easily become a planar fasciitis-type pain. Myofascially release the bottom of the foot before proceeding. Finally, because our feet and core are so deeply integrated you want to begin to integrate abductor strengthening with deep lateral rotator strength. Throughout the repetitions focus on the deep hip and pelvic floor engagement. To increase the activation of the deep hip and pelvic floor I encourage my clients to before their foot exercises on a single leg. Back Musc Rehab, 2013. 26: 163-168. Normal gait requires at least 5 degrees of ankle dorsiflexion, with maximum dorsiflexion occurring closed chain during late mid stance when the subtalar joint is passing through neutral. Limited ankle joint dorsiflexion can result in a myriad of compensations both proximally and distally. From knee hyperextension to midfoot over-pronation (calcaneal eversion), the deforming forces caused by tight calves is enough to make any Movement Specialist cringe. I refer to this lack of ankle joint dorsiflexion as a “Podiatric Epidemic” as a majority of people assessed lack adequate ankle joint range of motion. I often reference the correlation between proximal pelvic influences on ankle joint range of motion and calf flexibility. In the case of a client or athlete with an anterior pelvic tilt position and over-active hip flexors, integrating hip flexors stretches or myofascial release will often relax the tight calves and increase ankle joint mobility. However for those clients or athletes who have adequate pelvic flexiblity but demonstrate decreased ankle range of motion, we want to integrated posterior group stretches. When recommending posterior group stretches some of the classic stretches include the wall stretch, downward facing dog and dropping a heel off of the step. When performing theses stretches have you ever considered the role rearfoot position may have on the effectiveness of that stretch? A 2009 study by Jung et al. evaluated the impact of rearfoot position on the effectiveness of gastrocnemius stretching. 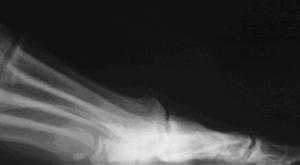 Due to the prevalence of tight gastrocs in an over-pronated (everted) foot type, Jung et al. wanted to determine if the everted calcaneal position altered the effectiveness of the stretch. Jung et al. evaluated 30 patients with both a neutral foot type and an over-pronated foot type with increased calcaneal eversion (average 4 degrees). Subjects performed a gastrocnemius wall stretch both in their relaxed calcaneal stance position and while wearing orthotics which placed the calcaneus in a neutral position. Ultrasound technology was used to evaluate the degree of stretch as determined by the change in myotendinous length. It was observed that rearfoot position had a significant impact on the effectiveness of posterior group stretching with a 3mm increase in gastroc length when the rearfoot was held in a neutral position. It emphasizes the impact subtle adjustments in body positioning can have on stretching effectiveness. As evidence-based professionals, if we can apply research studies such as this into our client’s programming we may begin to see better results. It re-emphasizes the concept of foot-specific programming I integrate into my Barefoot Training Specialist workshops. In an over-pronated foot type with increased calcaneal eversion and decreased medial arch you want to be careful with the impact ankle stretching may have on the weakened posterior tibialis tendon. When the calcaneus is brought out of the excessive eversion the stretch becomes more isolated to the Achilles tendon and gastrocnemius with little stress to the posterior tibialis tendon. I have had many patients return to me after doing physical therapy and calf stretching through an everted or pronated foot. How can the fitness professional integrate this evidence into their programming? For any clients with an over-pronated foot type, isolated gastroc stretching should be performed preferably non-weight bearing to minimize the impact of rearfoot position on the stretch. If the clients have orthotics that control rearfoot motion, perform closed chain gastroc stretches with the orthotics and then remove the shoes and orthotics for any barefoot training exercises. 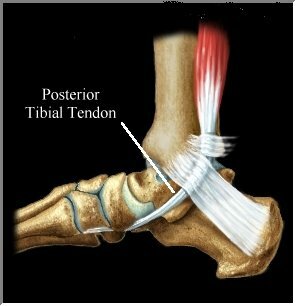 For any clients with an over-pronated foot type who wear Vibrams or minimal footwear for daily use and training, frequent evaluation of posterior tibial tendon condition should be performed.